There is nothing more rewarding than going out to your garden and picking fresh fruit. One of my favourite fruit to plant are blueberries, Vaccinium corymbosum. These are the types of blueberries you get in the grocery stores. I love popping a few in my mouth whenever I walk by, although I rarely stop at a few. Of course, there are numerous health benefits to blueberries. They are high in antioxidants. They can help reduce abdominal fat, triglycerides, and cholesterol and can offer protection against hypertension and colon cancer and improve memory function. For me, the most important benefit is that they make my Bran Buds a lot easier to eat. The joys of getting older. They are relatively easy to grow and aren’t plagued with problems like many fruit seem to be. I’ve never sprayed my own blueberries with dormant oil in the spring or any other pesticides. You can grow them in full sun or partial sun. Give them lots of organic matter when planting and they need an acidic soil. Acidifying your soil can be quite easy. After you’ve planted your blueberries, sprinkle some elemental sulphur above the roots and work it into the soil a bit, then water well. You’ll need to do this every once in a while to keep the acidity level up. I find it’s very easy to just make this part of my spring chores around the garden and once a year is enough. Acidifying this way also means that you can have an acid lover like blueberries next to a plant that prefers neutral or even sweet soil. It’s not a bad idea to mulch around them to keep the moisture levels up. Adding oak leaves and pine needles to your mulch will help keep the acidity up too. Blueberries are also very winter hardy. My father grows them up in Elliot Lake. He said that North Country was just loaded with berries this year. 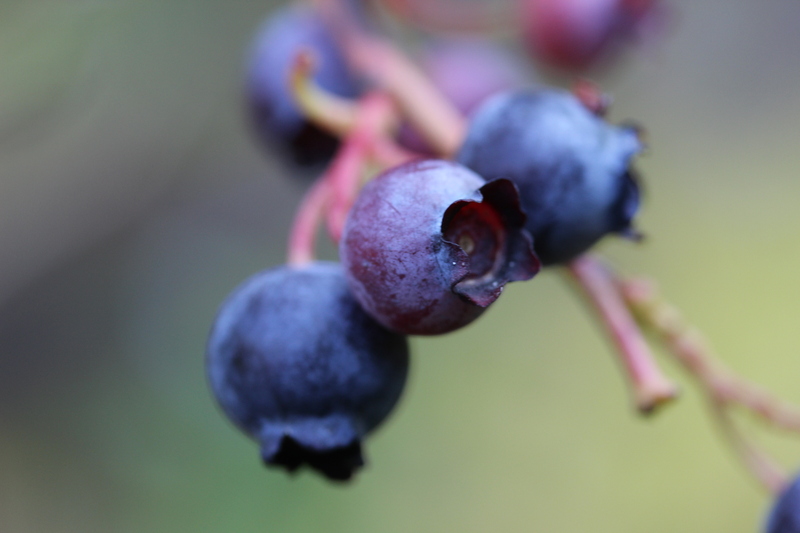 Blueberries are one of the best shrubs for attracting birds like cardinals, robins, sparrows, blue jays, cedar waxwings, and woodpeckers, to name a few. They also have a strong ornamental appeal making them easier to work into a garden. Their leaves are a glossy deep green and take on wonderful colours in the fall, ranging from orange to bright red to maroon. When I first opened the garden centre, this was the only small fruit that I sold, because it was the only one that I felt deserved to be in an ornamental garden. There are numerous cultivars around and they vary considerably in mature plant size. North Country and North Blue are smaller bushes that get to be two and three feet tall respectively. Most will get to be four to six feet tall, depending on the variety. While blueberries are self-fruitful, ie. one plant will produce fruit, if you plant at least two different cultivars, they will cross-pollinate and the number of berries produced increases exponentially. Those two plants don’t need to be side by side either. They could be 100 feet apart and still be effective. 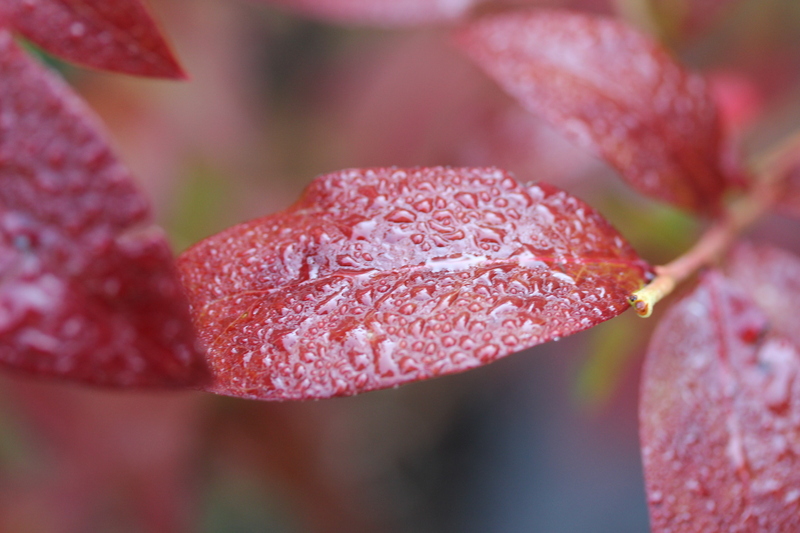 For those who prefer wild blueberries, there is Vaccinium angustifolium. Almost all of the above applies to them as well, except that they prefer dry, acidic poor soil. They are much lower growing, usually between six inches and two feet. You’ll find them in cottage country growing in the least hospitable places, often between rocks. This entry was posted in Uncategorized and tagged Blueberry, Fruit, Vaccinium. Bookmark the permalink. I just wondered if you had any brazelberries. I hoped to find raspberry shortcake, jelly bean and peach sorbet to plant in bulk at our cottage on Georgian Bay. If there are other varieties, as mentioned in your post, that are currently available I would be delighted to purchase as well. I am also interested in trying any grasses and hellebores that could withstand tons of wind and average soil. Really enjoyed perusing your website and look forward to visiting your garden. I will come by and give those a try.